When you are using the embed code for your calendars, there are a few additional URL parameters you can tack onto the end of your embed code. These URL parameters are useful because they allow you to make changes to your calendar’s functions without having to change your calendar settings within your account. 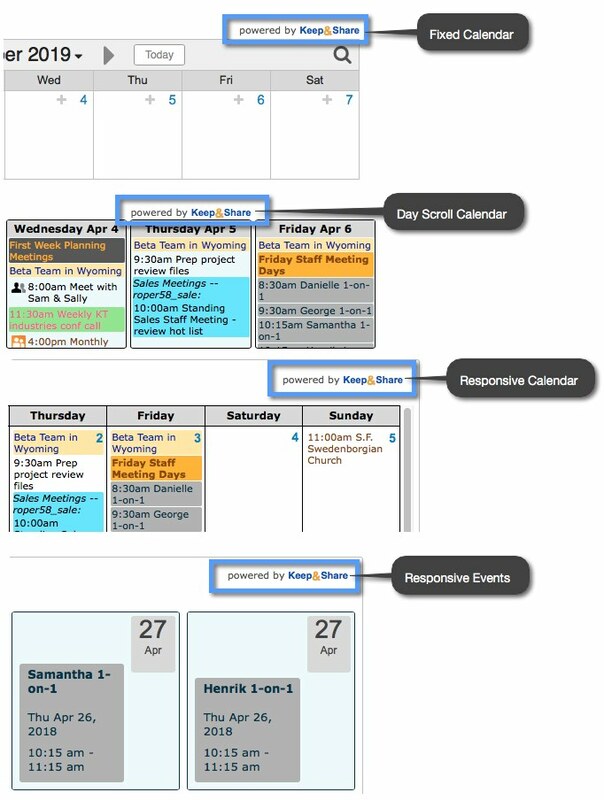 When you embed a calendar into a webpage (fixed calendar, day scroll calendar, or responsive calendar) you will see that there is a small “Powered by Keep&Share” logo on the embedded calendar right above your calendar. To remove this logo, add the parameter “&nopb=y” onto the endof your calendar’s URL within the code. See the example below, where the link for your calendar has been hightlighted in yellow and the added URL parameter is in bold. In your embedded calendar code, add the parameter “&date=YYYY-MM-DD” onto your the end of calendar’s URL within the code, where “YYYY-MM-DD” is replaced by a date you choose written in the YYYY-MM-DD format. In the example below, the start date has been choosen to be “2015-01-05." The link for your calendar has been hightlighted in yellow and the added URL parameter is in bold. This particular URL parameter is especially useful when you are embedding a Day Scroll Calendar. Since a Day Scroll only shows a few days at a time, you can choose what days are showing for your calendar. This is also useful if you what to keep the start date of your day scroll the same. If you do not specify a start date, the Day Scroll will always show the current date as the start day. You can set a time zone for your embedded calendar by adding a time zone parameter to your embedded calendar code. The time zone parameter is formatted as “&tzo=#” where “#” is the number of hours ahead of Greenwich Mean Time. Alternatively, you can use a negative number [such as -8] for the number of hours behind GMT. EST is “-5” hours, CST is “-6” hours, MST is “-7” hours, and PST is “-8” hours.